Is Bitcoin Responding To Brexit? Bitcoin has been on fire since April began. It’s been an impressive move so far. And no one has a good reason why. So I’m asking a simple question. Is Bitcoin’s rally part of the post-Fed safe haven rally we’ve seen across asset classes? Or is it just an overdue long probe mixed with some short-covering? At Money and Markets I make the argument that is was simply time for a rally which was set up by a strong Q1 close. Bitcoin and the rest of the cryptocurrency market have been mired in a bear market for fifteen months now since the spectacular bubble of 2017 burst. And that’s enough time for the market to become unbalanced enough that it needed a counter-trend correction. All it was looking for was a catalyst. To me, political turmoil is creeping up around the world. So, the idea of people quietly accumulating Bitcoin below $4000 doesn’t seem outrageous given how much our financial lives are now tracked. With all of the uncertainty surrounding Brexit, an imploding German economy, U.S. foreign policy insanity and upcoming European Parliamentary elections, there has to be a political component to Bitcoin’s big pop since it drifted higher over the weekend. 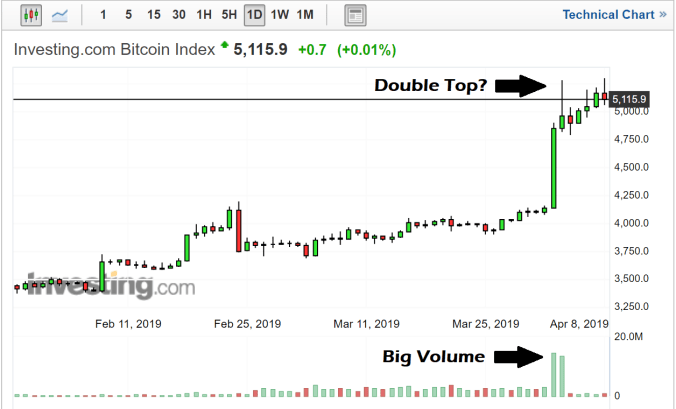 Looking at the daily chart it’s obvious that there was a big spurt of activity on the breakout days which pushed the price through $4100 and up close to $5300. And now we’re looking at a low-volume meander higher as bulls won’t give up the dream. But back to the broader question. We’ve seen a titanic set of moves in all safe-havenassets. German Bunds carry negative yield out to 10 years. (10 YEARS!). President Trump has nominated an outsider and personal friend, Herman Cain, to the FOMC board, nominally to frighten the Fed into cutting rates at the next meeting. But it won’t be. QE is deflationary. It signals a frightened central bank that doesn’t believe credit markets are healthy enough to operate without support. Markets are already struggling with valuations. It’s why we’re seeing multi-sigma moves in the Dow, U.S. Treasuries and major currencies while the central banks try to keep a lid on volatility. Brexit threatens to upend the smooth flow of capital between Europe and the City of London. If no deal is reached by Friday and the U.K. leaves the EU on WTO terms there will be retaliation by the EU for that outcome. They will trash the pound. They will impose the harshest tariffs they can and deny travelers, supplies and the rest. It’s a bluff in the long run, but a very real threat in the short run. Their economies are too linked to separate violently. And Germany is too weak to keep it all from coming unglued. What the EU fears is having to react to new market forces. A U.K. trading on WTO terms would pressure them to lower tariffs. It would rather subsume everyone else than reform itself. Hence, no movement on trade talks with the U.S. Harsh treatment of the U.K. over Brexit, if not outright assault. No reform possible for Italy. More TARGET 2 imbalances, Bail-in rules for banks, Article 7 censuring of Hungary and Poland. When you look at it that way smart people preparing for chaos simply makes sense. We have precedence for this. A lot of the Bitcoin’s transactional volume during the 2017 bull market came from Europe. Capital controls have been inhibiting cross-border flows since the 2011 debt crisis. Gold and bonds are confiscated across borders within the EU. Oh the tragic irony, people can move freely but not money. Bitcoin’s very nature invites this behavior. In times of extreme stress Bitcoin functions as a safe haven asset. And it doesn’t take much to move the price. So, one big European whale could set off a 25% relief rally during the chaos surrounding Brexit. And once he’s done buying, the natural rhythms of markets take over. I’m not convinced this move is anything more than that, however. I don’t think this is the new bull market. The real test is this week and the strength of any push towards $6000. If that fizzles, then we’ll see Bitcoin relax back towards $4000. And a lot of that will depend on what happens this week with Brexit. To support more work like this and get access to exclusive commentary, stock picks and analysis tailored to your needs join my more than 235 Patrons on Patreon and see if I have what it takes to help you navigate a world going slowly mad. China’s President Xi Jinping in Italy: It’s the Maritime Ports!